(Phys.org) —The question of how an economic system should be structured in order to best promote fairness and equality is one of the most debated subjects of all time. By approaching the complexities of this question from the field of network science, researchers from MIT and other institutions have found that the average degree to which individuals in a society are connected to each other can crucially affect the fairness of income distribution. The researchers, J. Borondo, et al., have published a paper on their research in a recent issue of Scientific Reports. In their study, the researchers constructed a model in which individuals can earn income in two ways: by producing content or by distributing the content produced by others. A system in which more income is earned by production than by distribution is labeled as meritocratic, while one in which more income is earned by distribution is called topocratic. Importantly, the income earned by distribution depends not on what an individual produces but rather on an individual's position in the network. 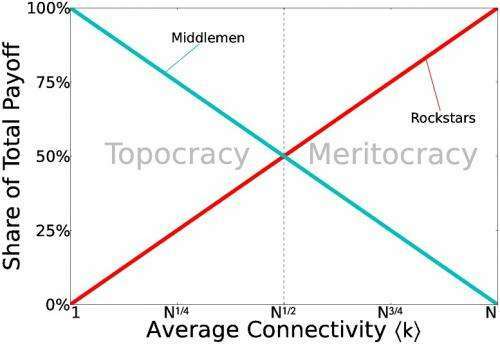 Using this simple model, the researchers showed that the connectivity of the network determines whether the income is earned in a meritocratic or topocratic manner: densely connected networks are more meritocratic, while sparsely connected networks are more topocratic. The difference makes sense, since individuals in densely connected networks can sell what they produce directly to others, and therefore do not need to share much of their proceedings with middlemen. On the other hand, in sparsely connected networks, individuals do not have direct connections with buyers and must rely on middlemen to help them connect. Using analytical tools from network science, the researchers were able to calculate the threshold at which a topocracy transitions to a meritocracy. This threshold depends on both the connectivity of the network and the rule used to distribute the income between content producers and middlemen. When the income is shared evenly between a producer and the middlemen involved in a transaction, the transition occurs when the average path length between any two individuals is two. So if there is more than one person, on average, standing between a producer and her buyer, then the network becomes topocratic. In this model, the famous six degrees of separation implies a highly topocratic system. When middlemen earn smaller percentages of the total sale, the threshold changes, following a power law whose exponent depends on the size of the commission. So when the middlemen's cut is smaller, less connectivity is required for the network to become meritocratic. The results raise the question of how modern-day society is evolving in terms of networking. Due to advances in communication technologies and social networking sites, it's widely accepted that the connectivity of our society has been increasing. From the researchers' perspective, communications technologies are essentially reducing the cost of networking by making it easier for a person to directly interact with many other people, and hence, help make our society more meritocratic. The model predicts that the internet, by giving individuals the ability to market directly to each other (or through one large mediator such as iTunes, Amazon, or eBay), is playing an important role in increasing the meritocracy of society by reducing the long chain of intermediations that define poorly connected societies. From this perspective, the internet seems to be promoting the fairness of income distribution in society. Although the researchers see the meritocratic structure as favorable to the topocratic one, they caution that denser networks are not always preferable to sparser networks. For instance, sparser networks may better preserve cultural diversity and limit the spread of disease, among other benefits. In addition, previous research has shown that sparse networks prevent free-riders from prospering because of their limited direct connections. When free-riders must go through a middleman to exploit another individual, the middlemen may play the crucial role of enhancing cooperation. Does the internet promote fairness of income distribution? Here's a more important question...is there a universal objective definition of "fairness of income distribution"? If there isn't the question is meaningless except to people who agree with the premise of those doing the study. No exactly helpful research. The study talks about "fairness and equality" of income distribution, as though the two are the same. In fact, they are diametrically opposed. It should be clear that a meritocracy, where people are rewarded on the basis of their contributions, actually increases inequality. How many "rockstars" do you think there are? It is the increasing connectivity of the modern world which is at the root of the current increasing income inequality. The key question is, "What do we do about it?" We are heading towards a future where only a small percentage of the human race will be responsible for producing everything we need. What will the rest of the population do? People who produce less of value make less than those who produce more of value. That inequality (which is good) is why I went to college and made something of myself rather than working in grocery stores for the rest of my life. I never sat around and bitched about how I should get paid $50 an hour to organize various breads and burrito wraps on a shelf because I knew it had to be that way and I had a plan to make myself worthwhile to hire for more money. As long as incentive is not hindered...if I work hard, then I should keep what I earn. Lazy people should get what they work for....minimum wage at Walmart!!!! I tell my kids all the time, make yourself more valuable, by learning skills, attending school, and anything that maximizes your efforts! I am surprised at some of the comments, since the model is NOT about equality but about the underlying support of the inequality that the model is designed to always exhibit. In fact, the model transitions between two states that are unequal but where the inequality hinges on different things. In the first case, when the market is complete (everyone is connected to everyone) the system is unequal yet meritocratic, since contributions flow back to those producing content. This is the only world that Huns and Raealist99 believe can exist. When the market is incomplete (sparse networks) the system is also unequal, but in this case it is topocratic since much of the compensation gets "dissipated" in the intermediation needed for the market to be completed. So I am glad Huns went to college, but he must have failed reading comprehension. Unfortunately with very few large mediators that turns into a topocracy again (as they have a virtual monopoly on the distribution as a go-to entity and can artificially raise their cut at the expense of the producers...which Apple, Amazon, etc. are doing currently to an alarming extent). Meritocracy only happens if connectivity is high and the middlemen that still exist are many and small.